In Polynesian mythology, people, the elements and every aspect of nature are descended from the one primal pair, the Sky Father and the Earth Mother. It was for this reason that the ancient Maori identified themselves so closely with nature. Before felling a tree (so slaying a child of Tane Mahuta, god of the forest) they would placate the spirits. Searching for food they would not speak of their purpose for fear that the prey might hear and make good its escape. In the beginning there was only the darkness, Te Ponui, Te Poroa (the Great Night, the Long Night). At last, in the void of empty space, a glow appeared, the moon and the sun sprang forth and the heavens were made light. 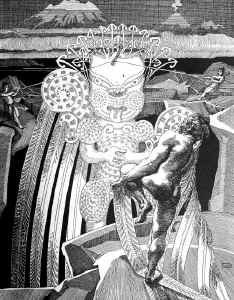 Then did Rangi (the Sky Father) live with Papa (the Earth Mother), but as the two clung together their offspring lived in darkness. The Sky lay upon the Earth, and light had not yet come between them. Their children were vexed that they could not see, and argued among themselves as to how night and day might be made manifest. The fierce Tumatauenga (god of war) urged that they kill their parents, but Tane Mahuta (god of the forests) counselled that they separate their father Rangi from their mother Papa and in that way achieve their object. Tane's wisdom prevailed, and in turn each of the children struggled mightily to prise the Sky from the Earth. Rongo (god of cultivated food) and Tangaroa (god of the sea) did all they could, and the belligerent Tumatauenga cut and hacked. But to no avail. Finally it was Tane Mahuta who by thrusting with his mighty feet gradually lifted the anguished Rangi away from the agonised Papa. So was night distinguished from day. Heartbroken, Rangi shed an immense quantity of tears, so much so that the oceans were formed. Tawhiri (god of wind and storm), who had opposed his brothers in the venture, was fearful that Papa would become too beautiful, and followed his father to the realm above. From there he swept down in fury to lash the trees of Tane Mahuta until, uprooted, they fell in disarray. 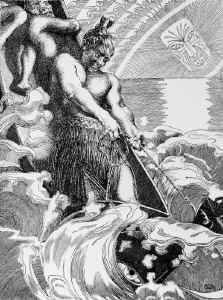 Tawhiri then turned his rage on Tangaroa (god of the sea) who sought refuge in the depths of the ocean. But as Tangaroa fled his many grandchildren were confused, and while the fish made for the seas with him, the lizards and reptiles hid among rocks and the battered forests. It was then for Tangaroa to feel anger. His grandchildren had deserted him and were sheltering in the forests. So it is that to this day the sea is eating into the land, slowly eroding it and hoping that in time the forests will fall and Tangaroa will be reunited with his offspring. The creation of woman: When the participants lay exhausted and peace at last descended, Tane Mahuta fashioned from clay the body of a woman, and breathed life into her nostrils. She became Hine-hauone ('the Earth-formed Maid') and bore Tane Mahuta a daughter, Hine-titama ('the Dawn Maid') who in time also bore daughters to Tane. But Hine-titama had been unaware of her father's identity, and when she found he was the Tane she thought was her husband, she was overwhelmed with shame. She left the world of light, Te Ao, and moved to Te Po, the world below, where she became known as Hinenui-te-Po ('Great Hine the Night'). The children of Tane were plentiful, and increased and multiplied, for death held no dominion over them. An essential reference work for collectors, dealers, institutions and researchers. The Mapping of North America II continues on from the first volume in documenting the printed cartographic record of the discovery of the continent from 1670 to 1700. Much has been written on the printed word in relation to America, and many works exist on the cartography of it. None however has attempted to comprehensively detail every known printed map. 612 pages, 270 x 365 mm., bound in burgundy cloth with colour dustjacket. With 12 + 364 map entries, 12 colour plates and 392 black and white photographs. ISBN 978-0-9527733-1-3. Click here for more information about The Mapping of North America. Maui, fifth of his parents' sons, was born so premature, so frail and so underdeveloped that he could not possibly have survived. So his mother, Taranga, wrapped the foetus in a knot of her hair and threw it into the sea - hence Maui's full name of Maui-tikitiki-a-Taranga ('Maui, the topknot of Taranga'). For certain he would have died, but the gods intervened and Rangi, the Sky Father, nursed him through infancy. As a grown child, Maui returned to confront his bewildered mother and to amaze his family with feats of magic. Not surprisingly, Maui's four brothers were jealous of the favouritism shown him by their mother Taranga, but when he offered to slow down the sun so that the days would be longer and they would all have more time to find food, they agreed to help. Carrying the enchanted jawbone of his grandmother, Maui led his brothers eastwards, to the edge of the pit from which the sun rises each morning. There, as it rose, the brothers snared the sun with huge plaited flax ropes. As they held it still, Maui with the enchanted jawbone cruelly smashed the sun's face time and time again, until it was so feeble that it could but creep across the sky - and continues so to do to this very day. Maui's brothers, weary of seeing their younger brother catch fish by the kit full when they could barely hook enough to feed their families, usually tried to leave him behind when they went fishing. But their wives complained to Maui of a lack of fish, so he promised them a catch so large they would be unable to finish it before it went bad. To make good his boast Maui carefully prepared a special fishhook which he pointed with a chip from the magic jawbone, and then hid under the flooring mats of his brothers' fishing canoe. At dawn the brothers silently set sail, thinking they had managed to leave their brother behind, and only when they were well out to sea did Maui emerge. The brothers were furious, but it was too late to turn back. After they had fished in vain, Maui suggested that they sail until well out of sight of land, where they would catch as many fish as the canoe could carry. The dispirited brothers were easily persuaded, and Maui's prediction came true. But even when the canoe was so overladen with fish that it was taking on water and the brothers were ready to set sail for home, Maui produced his own hook and line and against their protests insisted on throwing it out. For bait, he struck his nose until it bled and smeared the hook with his own blood. As Maui began to chant a spell 'for the drawing up of the world' the line went taut. Though the canoe lurched over and was close to sinking, Maui grimly hauled all the harder and his terrified brothers bailed the more furiously. At last Maui's catch was dragged to the surface and they all gazed in wonder. For Maui's hook had caught in the gable of the whare runanga (meeting house) of Tonganui (Great South) and with it had come the vast wedge of land now called the North Island of New Zealand, called by the Maori Te Ika a Maui, 'the Fish of Maui'. Such an immense fish was indeed tapu (sacred) and Maui hastily returned to his island home for a tohunga (priest) to lift the tapu. Though he bade them wait till he return before they cut up the fish, Maui's brothers began to scale and eat the fish as soon as he was gone - a sacrilege that angered the gods and caused the fish to writhe and lash about. For this reason much of the North Island is mountainous. Had Maui's counsel been followed the whole island today would have been level. In mythology the feat of Maui in providing land ranks only after the separation of Earth and Sky in the story of creation. According to some tribes not only is the North Island the 'Fish of Maui' but the South Island is the canoe from which the gigantic catch was made and Stewart Island its anchor-stone. Maui's fishhook is Cape Kidnappers in Hawke's Bay, once known as Te Matau a Maui, 'Maui's fishhook'. Throughout Polynesia the Maui myths are recounted and the claim is made by other islands that Maui fished them from the deep. This supports the theory that Maui may have been an early voyager, a creator-discoverer, who seemed to fish up new land as it slowly appeared above the horizon. Maui's final feat was to try to win immortality for mankind. Had not Maui tamed the sun? Could he not also tame the night of death? With an expedition, Maui set out to the west, to the place where Hinenui-te-Po, the goddess of death, lay asleep. To accomplish his aim, Maui was to enter her womb, travel through her body and emerge from her mouth. If he succeeded death would never have dominion over humans. With the bird who went with him Maui discussed the plans for his most daring feat, for which he would take on the form of a caterpillar, his magic jawbone making such transformation possible. But the sight of Maui as a caterpillar inching his way over Hine's thigh as she lay sleeping was altogether too much for the little tiwakawaka (fantail), who could not restrain a chirrup of delight. With a start Hine awoke, realised the plan and crushed the helpless Maui between her thighs. So died Maui-tikitiki-a-Taranga, and so death remained in the world for ever more. You also are mortal - remember that, and mould your conduct accordingly during your brief time in this world. Linguistic, molecular biological and archaeological evidence has established that Polynesia was peopled from Asia. Mitochondrial DNA studies demonstrate that Polynesians and the aboriginal population of Taiwan share a common ancestor, and language evolution studies suggest that the origin of most Pacific populations lies in Taiwan, about 5200 years ago. As the population there expanded, people probably filtered east across the Malayan, Philippine and Indonesian archipelagos and Melanesia. This movement became increasingly isolated from its cultural origins, the culture it carried began to develop independently and recognisably differing cultures ultimately emerged. By about the time the movement reached Tonga and Samoa, perhaps 4,000 years ago, the 'Polynesian' culture may be said to have emerged. Thor Heyerdahl has argued that the population movement from Asia in fact took place in a northerly direction, then swept east across the Bering Strait and finally reached the Pacific proper by way of the Americas. Central to this thesis is the presence throughout Polynesia of the kumara, a sweet potato native to South America, the distribution of which remains something of a puzzle. The kumara grows from a tuber and so could not have been borne by birds; nor, it is clear, could the plant have survived being carried by sea currents across the ocean from South America to East Polynesia. It must have been carried by human travellers. Moreover, not only is the plant found throughout Polynesia, but it is also known by its South American name. Although Heyerdahl's celebrated Kon-Tiki expedition (1947) established that it was possible for Polynesia to have been peopled by way of the Americas, his theory has failed to win general acceptance. Kumara has been radiocarbon-dated in the Cook Islands to 1000 AD, and current thinking is that it was brought to central Polynesia circa 700 AD, possibly by Polynesians who had traveled to South America and back, and spread across Polynesia to Hawaii and New Zealand from there. In time the Marquesas and later the Society Islands evolved as early centres of Polynesian culture. On one of the Society group, Rai'atea (west of Tahiti), Polynesian culture found its highest form. Many believe that it was this revered cultural centre that was 'Hawaiki', a place much venerated in tradition as the 'homeland' of the Maori people, for it is plain that Maori culture derives from East Polynesia. The concept of 'Hawaiki', of a 'homeland' from which the forbears of each migratory group had come, is found throughout Polynesia and is applied to differing areas both within and without the region. It may simply have been a general way of describing the area from which the last movement had been made in the course of the settlement of the island groups throughout Polynesia. It was on the base of Polynesian culture that the intricacies of Maori culture were structured. Indeed, throughout Polynesia there are common elements in language, legend and place names. The myth of the separation of Earth and Sky is generally constant, and the Maui cycle is common throughout the region. According to popular tradition (whose authenticity is at the very least questionable) it was the Polynesian voyager Kupe (fl. c. AD 950) who discovered New Zealand, a land he named Aotearoa (usually translated as 'land of the long white cloud' or 'land of mists'). In one of a variety of conflicting legends it is said that in 'Hawaiki' Kupe had murdered the carver Hoturapa and made off not only with Hoturapa's canoe, but also with his wife. Hoturapa's relatives sought vengeance and pursued the guilty pair who, in the course of a lengthy voyage, lived for some time in Aotearoa and named several of its features. Curiously, only some tribes have any traditions of Kupe at all. Those who do generally say that Kupe found the 'Fish of Maui' uninhabited and eventually returned to 'Hawaiki' to give the sailing instructions that, according to popular belief, were followed by migrating canoes four centuries later. If Kupe encountered no tangata whenua ('people of the land'), according to popular tradition the next Polynesian voyagers said to have reached Aotearoa most certainly did. Whatonga (c. 1130-90? ), so one version runs, was competing in canoe races off 'Hawaiki' when, in a sudden storm, his canoe was blown out to sea. His grandfather, Toi (fl. c. 1150), despaired of his ever returning and so set out to find him. In the meantime Whatonga is said to have returned to 'Hawaiki', to have found Toi gone and in turn to have set out to look for him. The story concludes with the pair being reunited at Whakatane (Bay of Plenty) in c. 1150. 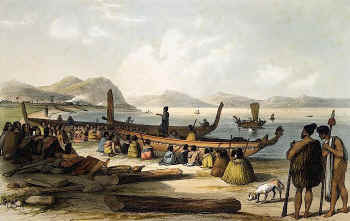 Those on Toi's canoe intermarried with local tangata whenua and settled at Whakatane to form the genesis of today's Ngati Awa and Te Ati Awa tribes. Those with Whatonga made their homes on the Mahia Peninsula. The chronology of these genealogies is surely totally unreliable. The Kupe-Toi-Whatonga chronology is based in present-day tradition and, with the 'Fleet' myth, is viewed with scepticism by most historians. However, some genealogies establish Kupe in the 14 C and so would have him living in Aotearoa right at the time that settlement seems to have been established, based on radiocarbon dating - see dating of the appearance of the polynesian rat, below. Toi is placed anywhere from 29 to 42 generations ago, and some conclude that not only were there two Kupe but there were also two Toi - Toi kai rakau, a native-born origin ancestor, and Toi te huatahi, a 'Hawaikian' who never came to New Zealand. Some early students of the Maori distorted and even at times destroyed material that did not accord with their theories. The works of these historians have passed not just into European folklore but have been 'fed back' into Maori tradition. This is not to discount completely the value of Maori tradition as a clue to prehistory, but to query the status accorded some tradition as authentic Maori tradition. Recent radiocarbon dating of rat-gnawed seeds seems to date the arrival of the first people in New Zealand as definitively around 1280, some 360 years before the arrival of European explorers (Abel Tasman, 1642) (Wilmshurst et al. PNAS 2010). The Pacific rat (kiore) cannot swim very far and hence must have arrived in New Zealand as a stowaway or cargo on polynesian canoes. The rat gnaw marks on seeds are unmistakable and radiocarbon dating of the bones of rats themselves also gives an earliest limit of 1280. This is consistent with other evidence from the oldest dated archaeological sites, some Maori whakapapa (genealogies), widespread forest clearance by fire and a decline in the population of marine and land-based fauna. Most whakapapa yield likely dates several hundred years earlier but they provide weak evidence at best. Tradition continues that two centuries after the expedition of Toi and Whatonga, the Society Islands (Windward and Leeward Islands, including Tahiti) had become so overpopulated that food shortages and war were inducing a number of Polynesians to migrate. In Maori tradition, a number of canoes made the journey to New Zealand, among them the Arawa, Tainui, Aotea, Mataatua, Tokomaru, Takitimu, Horouta, Tohora, Mamari, Ngatokimatawhaorua, Mahuhu and Kurahaupo. 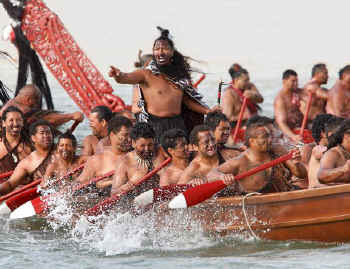 It is from these canoes, which some believe arrived in the 14 C, that most Maori claim their descent. Early New Zealand historians gave rise to the concept of an organised 'fleet' setting sail for New Zealand, but this view has been completely discredited and is without foundation in Maori tradition. Conversely, it has even been suggested that a single canoe with perhaps 30 occupants, of which half were women, could, with an annual increase of only one percent, account for a population in 1769 of the dimensions described by Cook. According to this theory a single canoe might have landed in Northland, New Zealand, from 'Hawaiki'. Over the generations the 'ancestral' canoes of Maori tradition might have set sail not from the Society Islands but from a Northland 'Hawaiki', and not to voyage across the Pacific but to skirt the New Zealand coastline. That at least one canoe arrived from East Polynesia, either directly or indirectly, is beyond dispute (and if one could arrive, why not two?). Why it came remains a matter of controversy. Did each canoe which came deliberately set sail for New Zealand? Or did they come by chance over a span of up to three centuries, being blown off course while travelling between groups of islands? This suggests that the peopling of the farther islands of Polynesia such as New Zealand and Hawaii may have been accidental rather than deliberate - or the product of 'drift voyages' which took place when whole groups were forced to abandon their home islands and simply set sail for wherever the elements bore them. However, there is a considerable body of opinion and evidence to the contrary and the topic remains one of controversy. Maori tradition with its history of ancestral canoes generally opposes the theory of accidental settlement. Wherever their starting point, some of the ancestral canoes are said to have travelled in pairs for the greater part of the journey, and may have been single-hulled canoes lashed together. This would have given greater stability for an ocean voyage, with the hulls separating for the hazardous business of making landfall, and would explain how the Tainui and Arawa could have arrived at the same place (Whangaparaoa, East Cape) at so nearly the same time that the tribes could argue as to which had arrived first. It would also account for the Aotea canoe's being close by to rescue those in the Kurahaupo when it was wrecked en route. War canoe and sailing ships greet one another, early 19 C. Ships fire cannon, chief waves taiaha, pakeha canoe passenger waves hat. Once arrived, the canoe passengers soon intermarried with the tangata whenua. Although the tangata whenua (who had their own tribal groups) were ultimately absorbed, they remain important in the folklore of a number of tribes. These derive status and prestige from their descent from particular ancestral canoes but attribute their land rights to 'origin ancestors' among the tangata whenua. The presumed arrival of these later Polynesians is generally taken as marking the end of the Archaic era and the beginning of the Early Period of the Classic Maori era, although the two periods obviously overlap to a considerable degree. Of all the cultural innovations the new arrivals would have brought with them, the most far-reaching were tropical plants, pre-eminently the kumara (sweet potato). Hitherto the tangata whenua had lived a very much hand-to-mouth existence, dependent on wild plants and birdlife for survival. From this time on horticulture began to be practised (or at least to be practised on a scale not known before), slowly banishing many of the uncertainties of the past and stabilising the area where a particular hapu (sub-tribe) would live. This term means simply 'the people of the land', i.e. the people already living in a particular place. It can be used to refer to those Polynesians already established in a part of New Zealand when others arrived here, but the term is currently politically loaded, with modern Maori, who have, without exception, between one and fifteen European ancestors out of sixteen, claiming to be the tangata whenua of New Zealand while New Zealanders of European origin are regarded some kind of recent, illegitimate interlopers. The reality is that the Maori slaughtered the tangata whenua at least in the Chatham Islands (the moriori) and preceded the pakeha in settling New Zealand by around 470 years. However, we all live to some extent supported by our mythology, and the modern Maori, as a defeated people, have a profound psychological dependence on their perceived status as the tangata whenua of New Zealand. To question this is politically incorrect on a major scale and any New Zealand public figure doing so would be effectively falling on his sword. The expression is not a synonym for 'Archaic Maori' (or 'Moa Hunter') but may have that meaning where the context so requires. Before the arrivals from 'Hawaiki', the Archaic Maori (or Moa Hunter) thrived during what may be called the Archaic Phase of New Zealand Eastern Polynesian culture. Just where they came from with their simple culture, and when, remains more of a mystery than the doubt that surrounds the later arrivals from East Polynesia, but the Archaic Maori clearly originated in Polynesia (not, as some have suggested, in Melanesia) and was long thought to be established here at least by AD 750, but there is in fact no evidence of humans in New Zealand prior to 1280. Little of their traditions survived down to European times. They found the moa and other flightless birds, now extinct, both plentiful and easy prey. And with an abundance of food and a small population, war may have been virtually unknown - unless they used wooden weapons which have since perished. But as the number of moa dwindled, the Archaic Maori was forced to turn to fishing, fowling and tool-making (from such hard stones as obsidian), and perhaps even in a small way to experiment with horticulture. Although the Archaic Maori is popularly called a 'Moa Hunter', the expression, with its economic overtones, is misleading as there were areas of the country populated by people from East Polynesia who would never have encountered the bird. Archaeological evidence points clearly to the Archaic Maori population as concentrated in the South Island. This is to be expected as the moa (a flightless, emu-like bird of which there were several species, some about three metres in height) grazed on open grasslands of which the South Island had great areas. A large number of 'campsites', as Archaic Maori settlements are known, have been found, principally along the east coast of the South Island and on the North Island's west coast around Taranaki. Systematic horticulture dates from the introduction of food plants such as taro, uhi (yam), hue (gourd) and, most importantly, kumara - a variety of sweet potato and the only tropical plant really to flourish in New Zealand's cooler conditions. In tradition, Kupe, when eventually he returned to 'Hawaiki', reportedly summarised the New Zealand climate when he said that he preferred a warm breast to a cold one. However, it is likely that the climate was significantly warmer then than now. The kumara is a tropical plant and is not grown easily in New Zealand. It is probable that when the kumara was introduced, the climate permitted traditional cultivation techniques to be used and that, as it gradually cooled, these were adapted to the changing conditions. Evidence from a variety of sources points to a brief cool period in the mid-fifteenth century, and to a more sustained deterioration from the seventeenth to the nineteenth centuries. For protein, the Maori remained dependent on fish, birdlife and the occasional kiore (polynesian or Maori rat), and it seems that the practice of cannibalism may have had its origin in this lack of meat - although in later times it was to assume a religious rather than a dietary character. With systematic horticulture evolved the Classic Maori culture, with stabilised pa (fortified villages) replacing nomadic 'campsites' and with less permanent kainga (unfortified villages) generally sited close by the kumara grounds. In favourable areas, successful and intensive horticulture enabled experts to devote progressively more time to their specialities and progressively less to manual labour, and so saw arts such as carving and the making of ornaments flourish as never before and usher in the Classic Maori period. However, it is clear that the two cultural periods overlapped to a considerable extent. It is now believed that the kumara may have been introduced at a very much earlier date than was thought hitherto, and that the significant breakthrough came not with its introduction but with the development of effective storage methods, in particular the rua (underground pit). The kumara is highly susceptible to frost. It was when the technique of lifting the tuber in the autumn and storing it through the winter, both for food supply and for the next season's planting, was developed that cultivation would have become possible over a much wider area of the country. By the time Europeans arrived, less than five percent of the Maori population was living in the South Island, and in the North Island distribution was concentrated in the northern reaches - presumably because it was in this warmer area that the Classic Maori culture based on tropical horticulture could best thrive. Although some aspects of Maori culture were universal, there was significant regional variation not only in arts, crafts and language, but also in the way of life dictated by environmental and political factors. In some districts, societies lived in open, unprotected villages in an atmosphere of tranquility; in others the threat of imminent invasion provoked a preoccupation with the maintenance of strongly fortified pa.